The downing of Malaysia Airlines Flight 17 has been a difficult case to bring to court. Three years have passed since Malaysia Airlines Flight 17 was shot down, and the case is coming closer to court. 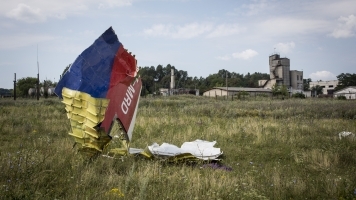 MH17 crashed near the border of Russia and Ukraine on July 17, 2014. All 298 people on board died. Investigations into the crash pointed heavily to Russia: The Dutch Safety Board found a Russian-made surface-to-air missile system brought down the commercial plane. Investigators believe Russian-backed militia fired the missile from Russia-controlled territory. Russia has denied all involvement, and a number of issues have made the case difficult to bring to court. A resolution sent to the United Nations asking for an international tribunal was blocked by Russia in 2015. Russian President Vladimir Putin said that tribunal would be "counterproductive." The Netherlands announced in early July that it would prosecute those involved in bringing the plane down. But officials haven't named any suspects, and no formal charges have been brought. Julie Bishop, the Australian foreign affairs minister, said: "We'll do all we can. It may be that there will have be to a trial in absentia." The plane also crashed in the middle of a war zone, making inspection and removal of plane pieces difficult. No formal start date has been set for trial proceedings.